J. Craig Thorpe is a nationally recognized artist specializing in conceptual renderings and landscape paintings. Says Robert Eaton, Mayor of Leavenworth, WA, “Craig understands the history, needs, and mission of our community. Our investment in his talents has more than paid for itself.” Craig’s interest in art dates from his formative years in Pittsburgh, PA. The landscapes of the area, with its undulating topography, rivers, industrial plants and railroads captured his imagination. The imagery of those experiences shaped the foundation of a career. Thorpe studied at the Art Institute of Pittsburgh, and graduated from Carnegie-Mellon University with a BFA in Industrial Design. Following a short stint in the US Army Transportation Corps, he worked for architects in Virginia. After graduate school in New England, where he earned a Master of Divinity from Gordon-Conwell Theological Seminary, Thorpe moved to Seattle, WA and served as a Presbyterian pastor. In 1985 he chose to leave parish work to begin free-lance architectural and transportation illustration. When Amtrak featured his painting of the new Olympia, WA station on its 1993 corporate calendar, Thorpe’s rail art began to be recognized nationally. He continues to produce commissioned works for Amtrak including the commemorative centennial paintings of Washington D.C. Union Station (2008) and Glacier National Park (2010). His most recent work is a collection of vignettes celebrating Amtrak’s 40th anniversary in 2011. 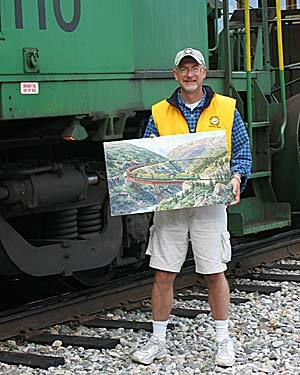 Craig is widely known for these and commissions by other rail clients such as the White Pass & Yukon Route in Alaska. Says Michael Brandt, the railway’s Vice President, “Craig has embraced the WP&YR brand and created iconic legacy artworks for us. They reflect his relationship with the company, its people, history and future.” Other noted Alaskan clients include Holland America Line and Alaska Marine Lines. The grandeur and scale of Alaska – and indeed all the west itself – have expanded his literal and figurative horizons. A new series of smaller Northwest landscapes is growing in popularity. Thorpe is foremost a landscape painter and even his industrial commissions set the subjects in their unique settings. Says the artist, “The haste, cynicism and expediency of our age has blurred an ability to see beauty. These paintings help people refocus.” He combines a technical accuracy with a painterly style evoking an emotional response from the viewer: “That painting makes me want to be right there!” He partners with clients to create art which honors tradition, celebrates the present and creates a legacy. While working in a variety of media, most of Thorpe’s published works are oil-on-canvas. His paintings have appeared on calendars, posters, cards, menus, timetables and a host of other items. J. Craig Thorpe’s work has been published in various papers and journals such as the Arizona Republic, Denver Post, and USA Today, National Parks Magazine, Audubon and books such as Alfred Runte’s Allies of the Earth: Railroads and the Soul of Preservation and Trains of Discovery: Railroads and the Legacy of Our National Parks. Thorpe and his wife Cathy, a counselor in private practice, live in Bellevue, Washington and have three grown children, each an artist in his own way.